Rising seas, mostly as a result of climate change, are threatening thousands of homes but the building in these flood-prone areas still continues, according to a new study from Zillow and Climate Central, a nonprofit organization researching climate change. As many as 386,000 homes in coastal regions across the U.S. worth a collective $209.6 billion are at risk of regular flooding by 2050, the study says — falling within the span of 30-year-mortgages inked in 2020. Specifically, the combined analysis found that San Mateo, California and Galveston, Texas, have the highest shares of their total housing at risk of chronic flooding by 2050 at 34.2 percent and 13.1 percent, respectively — if emissions continue as presently. By 2100, those shares rise to 41.6 percent and 78.4 percent, and are surpassed in share of housing at risk for chronic flooding by Miami Beach at 85.2 percent and Miramar, Florida at 81.5 percent. Looking at total number of homes impacted in 2050, San Mateo also leads the analysis with 8,951, followed by New York City at 6,259. By 2100, New York City would see 95,210 likely impacted homes, 6.4 percent of the total housing stock. The study used data gathered from multiple scientific reports gauging the melting of the Antarctic ice sheets published in the last two years, and data from the United Nations Intergovernmental Panel on Climate Change, consisting of leading scientists and information from 195 countries. It also relied on computer simulations of seal-level rise run thousands of times for each emissions scenario. The study notes that much could change in this time, including new infrastructure or current infrastructure degrading, which could make the scenarios better or worse for homeowners. Rising sea levels mean that the intermittent floods that coastal communities now experience will creep further inland, according to the study. The flooding can damage and devalue homes, degrade infrastructure, wash out beaches and interrupt transportation systems, the study adds. “Without intervention, hundreds of thousands of coastal homes will experience regular flooding and the damage will cost billions,” Olsen added. The research team behind the study suggests that a moderate cut of emissions could reduce the number of at-risk homes by about 10 percent by 2050. The estimates for 2100 are far grimmer. The study suggests that 1.3 million current homes are anticipated to be at risk, even if emissions are cut moderately. If emissions continue unchecked, the study suggests about 2.5 million homes – worth an estimated $1.3 trillion – would be at risk. Different communities will feel the impact in varying ways. Cities like Los Angeles – which sits high enough above sea level – will really only feel the impact on their beaches, according to the study. 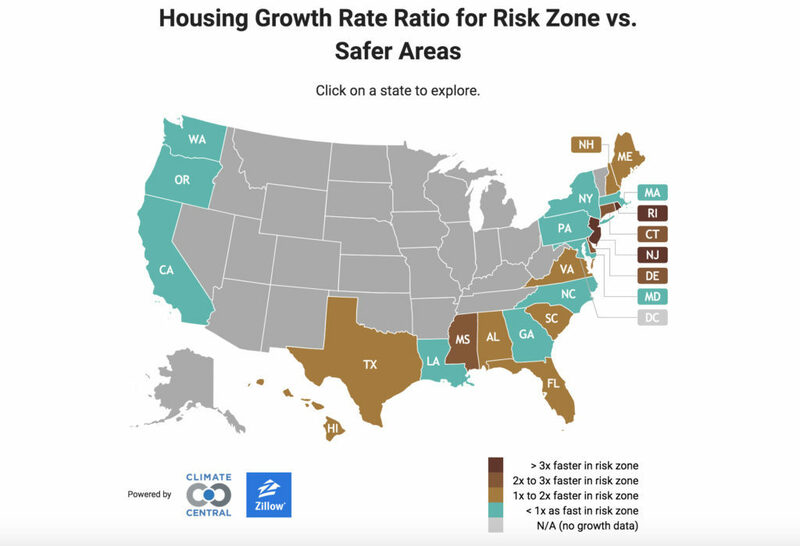 An estimated 10 percent of homes in Galveston, Texas and 7 percent in Ocean City, Maryland are projected to be at risk of annual flooding by 2050 and nearly half of the homes in both of those cities could be at risk by 2100 – even with moderate emissions cuts. By 2100, an estimated 75 percent of Hoboken, New Jersey and Miami Beach, Florida could face annual flooding. Despite the outlook, homes are still being built at a rapid rate in the flood-prone areas. In more than 50 percent of the country’s coastal cities, homes are being built at a quicker rate in flood-prone areas versus safer areas.